Anon: “There is an inherent short circuit in that kind of reasoning though. Unless there is an observation there is no point to have a formula about it, as there is nothing to formulate, right? So, empiricism is the first step, correct interpretation of the observation the second and most crucial step and only then can maths come into the equation. 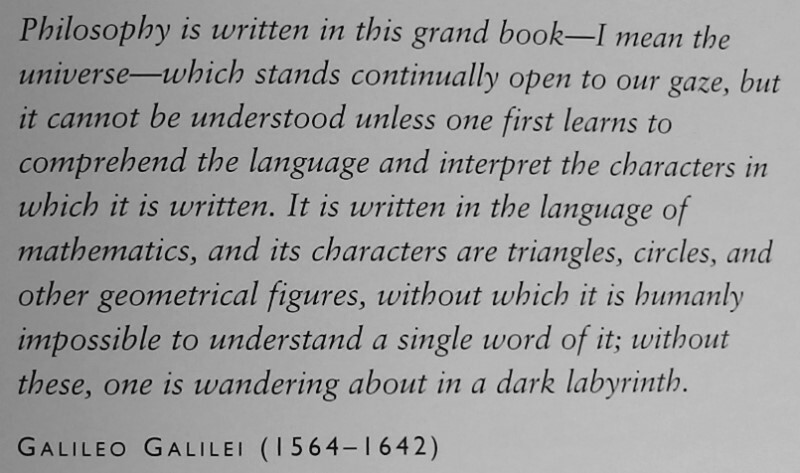 Anon: “Sure, it can be written in mathematics by humans, but the observation still comes first and the correct interpretation second! “Yes what you are getting at is a well-historied story of the idealists vs. the empiricists. Your remarks have been made by the greatest philosophers who have ever lived and your concerns are discussed at various places in Hockney’s God Series books. The empiricists say: Nothing in the mind that wasn’t first in the senses. The idealists say: Nothing in the mind that wasn’t first in the senses, except the intellect itself. The reason the idealists say that is because the senses cannot be detected without a mind to detect them in the first place. The empiricist says that nothing can be in the mind without first being put there by the senses; the idealist says that that statement therefore admits that mind has come first, because you first need a mind to put senses into. We must be careful for these two positions not to talk past each other. The concern of the idealist is the fundamental nature of reality itself, to understand and justify the very substance, the very most fundamental essence or starting point of existence, that which existence itself is made of. That is their concern. And they are right, that mind must come first before the senses, since the senses need a mind to detect them. And so, it is correct: mind is the fundamental essence of existence. Existence itself is made of mind. 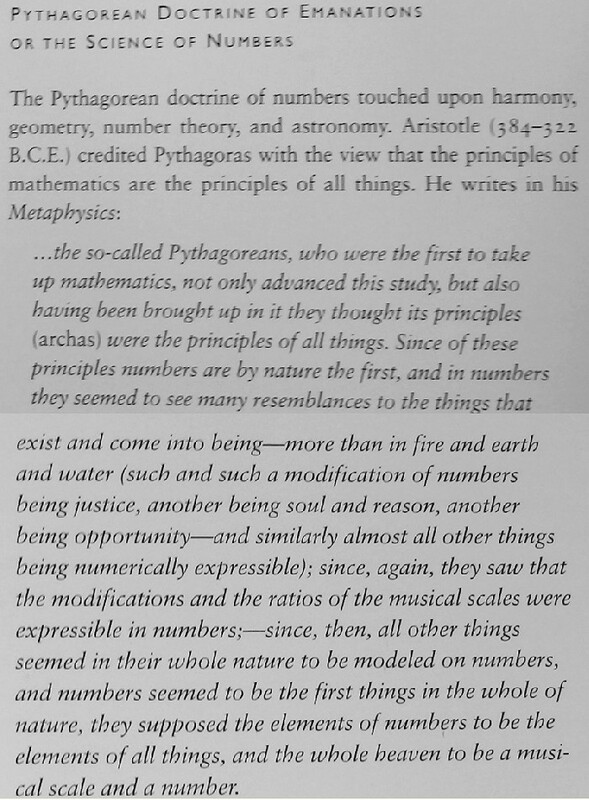 The Pythaogreans further concluded that mind must be structured by numbers, by mathematics, since only mathematics and numbers implicitly have structure; mind would be insane, and could do nothing, detect nothing, make sense of nothing, if mind was made of 2 + 2 = 5, 2*2 = 7, 1 – 1 = anything. Mind has to be structured, and 1 + 1 = 1 + 1 which we then denote as 2 is fundamentally structured, and, we see, empirically, reality being described by number everywhere. So, empiricism here supports idealism in confirming that reality is structured by numbers, by mathematics. If it wasn’t, it would just be insane noise. The trick, which humanity has not pursued since Pythagoras, although it was the next obvious step in the evolution of Pythagorean thought, is to determine the fundamental singular structure of mathematics itself which reality corresponds to. That is, is there a form of mathematics which is identical to nature? Is there special field of mathematics that all of reality reduces to? So, the idealists are concerned with establishing the fundamental basis of reality. The basis of reality is not the senses, not empiricism, because empiricism requires mind to detect things. The empiricists are concerned with something slightly different, and that is simply, how does one sensorily experience reality? That is, how do we know what is all out there? How do we know how mind/mathematics will manifest itself to the senses? You see, that is a different concern, and so the two positions talk past each other much of the time because they don’t appreciate either positions concern. The idealists are right: mind comes first, and as the Pythaogreans said, this means that math comes first since mind has to be structured by numbers. In theory, it would be possible to work out the set of mathematics which create reality just by thinking about this, just by thinking about what particular math reality needs to be based on. That is the entire project of Hockney’s books, and, he succeeds. But he succeeds now with the knowledge of empiricist science and the type of mathematics that it has developed. That is, if you’re not smart enough to work out all of the universal maths on your own, then let nature be your guide as Galileo said. In theory it could be done, but in practice it probably isn’t done all that often. A species who did do it would be a very special species indeed. The problem now arises in that science rejects the idea of a fundamental rational order underlying existence, and so empiricism has completely rejected the otherwise totally valid and correct conclusions of the idealists. Empiricism thinks that it can exist on its own without the guidance of idealism. This is wrong, and it has gotten empiricist materialist science into all manner of irrationalities, climate change being one of them, and Einstein’s relativity and Copenhagen quantum mechanics being others. None of these things are logically compatible with each other. Even Darwinian Evolution falls into fatal paradox in relation to these other fields of science. The solution is for empiricism to be at the service of idealism, because only idealism can save pure-empiricism from the paradoxes it runs itself into. You are right: interpretation is crucial! There is nothing more important, in fact, than interpretation. Empiricism thinks that it can get by without performing the appropriate philosophical interpretation, and this is why it creates so many internal inconsistencies and contradictions within its own various fields of pursuit. Empiricism must turn to idealism in order for its sensory findings to be correctly logically fitted in to the rest of known physics. Phlogiston was an empiricist supposition, created by the uber-empiricist practice of alchemy. Any idealist philosopher at the time would have ridiculed the idea that fire is created by a substance which has a virtue of being on fire. It is like saying that opium creates sleepiness because of its dormitive virtue. These seem to be explanations, but only to an empiricist because the explanations are in fact completely empty of deeper meaning or truth. You could say that mind and observations are also implicitly connected in any case. Mind implicitly, immediately, recognizes its own existence through the observation of its own existence. Hence Descartes: “I think, therefore I am.” Mind, which IS thought, is its own observation of its own existence. It then creates a universe to figure out why it exists, and what its optimal expression is, which it then seeks to express. And the ultimate, optimal expression of mind is God. Hence we, and every other point of existence itself, as individual nodes of mind, are all becoming God. Gallery | This entry was posted in Illuminism and tagged Illuminism, Mike Hockney, ontological mathematics, Pythagoras, Pythagorean Illuminati. Bookmark the permalink.